(2) electrometrically, with a polarographic D.O. meter. 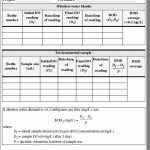 Because of the difficulties involved with the Winkler titration method, almost all laboratories use D.O. meters for performing the BOD test. D.O. meters can be temperamental devices. To be accurate, D.O. meters must be calibrated before each use, preferably close to the time that they will be used to make measurements. Calibration is typically done using the theoretical dissolved oxygen value of saturated air, after correcting for variations caused by temperature and atmospheric pressure. 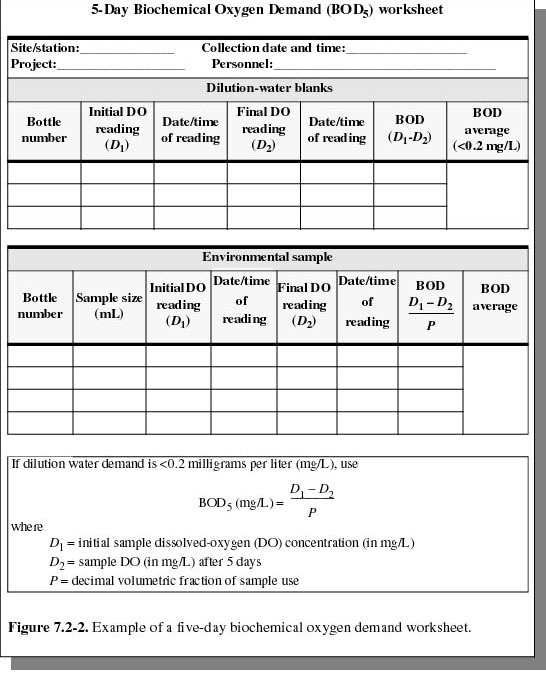 To obtain the accuracy required for the BOD test, an atmospheric pressure reading from an accurate (calibrated) barometer should be used to obtain the theoretical dissolved oxygen calibration value. This is different from the “altitude correction factor” which is acceptable when calibrating field D.O. meters, but the high degree of accuracy required demands it. Be aware that laboratory barometers should be calibrated against a local airport barometric reading, but the airport reading must be converted to a true barometric pressure that has not been adjusted for altitude. BOD incubators look like refrigerators, but they actually can heat or cool as needed to maintain an inside temperature of 20º C +/- 1º C. Good laboratory practices dictate that the incubator temperature should be carefully determined and recorded at least two times a day for the entire incubation period. The thermometer used to measure the BOD incubator temperature must be calibrated against a thermometer certified by NIST at least once a year. If the temperature inside the incubator goes above 21º C or below 19º C at any time during the incubation period, the test is invalidated and the results cannot be used for reporting purposes. Microorganisms metabolized Glucose (a simple sugar) very rapidly and at an unpredictable rate. Glucose that has been stabilized by the addition of Glutamic acid is metabolized by microorganisms at a steady rate. Because of this, GGA can be used as a BOD standard. [Remember, a standard is a substance whose chemical constituents are very accurately known]. Carefully weighing 150 mg of dry Glucose and 150 mg of dry Glutamic acid with an analytical balance and making it up to exactly one liter with pure water will yield a BOD standard. A 2% dilution of this standard (6 mL in a BOD bottle) will result in a BOD of 198 mg/L. If the BOD of the standard is close to 198 mg/L, we assume that the measurements of the samples were accurate as well. The tolerance for the GGA standard is 198 mg/L +/- 30.5 mg/L. In order to ensure that BOD tests are providing reliable results, a GGA standard must be run at least 10% of the time along with samples. If the GGA standard does not fall within the tolerances, the entire set of BOD sample data associated with the failed GGA standard becomes invalid (the sample data is thrown out and cannot be used for reporting). If one GGA bottle is within the tolerance and one is out, the data can still be used. Because of the consequences of failing the GGA standard, most laboratories run GGAs with every sample set that is analyzed. This way, if the GGA fails, only that sample set is invalidated, as opposed to invalidating several weeks of data (if the GGA is run infrequently). Even with all of the previously discussed quality control measures, the BOD test typically has an accuracy of +/15%. Because of this, it is important that externally supplied standards be analyzed at least annually to ensure that the level of accuracy being delivered is acceptable. Externally supplied BOD standards can be purchased commercially.